CSG Government Solutions is a national leader in planning, managing and supporting complex projects that modernize the information technology and business processes of large government programs. Since 1997, we have applied our expertise, innovation, and results-oriented mindset to the most complex program modernization projects of over 150 government and other organizations. We work with our clients in a spirit of partnership and collaboration to deliver the right results at the right time, for the right price. 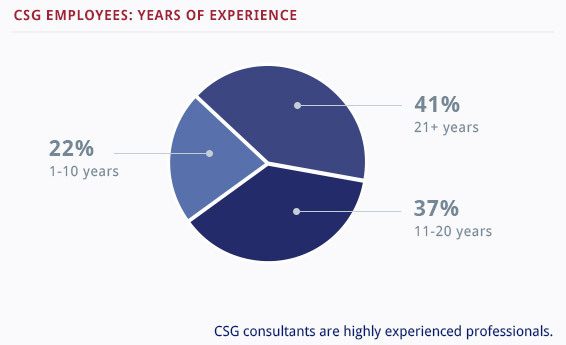 Over the years, CSG has attracted many of the most respected people in the government programs we serve. Senior experts with long careers in government and other organizations around the U.S. are a part of the CSG team. Our company is structured to derive maximum value from the experience and knowledge of these leaders and incorporate it across all of our client projects and teams. The operation of CSG’s business and the work of our project teams are characterized by The CSG Way, an environment that emphasizes common understanding, teamwork, communication, clarity of roles and responsibilities, and consistent high-quality work. Our people are continuously trained in The CSG Way and always conduct our work according to its guiding principles and specific processes.